As usual, every year starts off with the “Hanger Shoot” in Daytona. 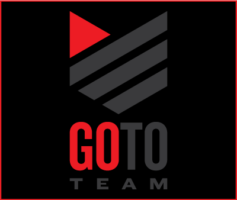 Go To Team and FOX rent out an entire airplane hanger. Six rooms are constructed inside the hanger. Each room is assigned to shoot a specific element that will inevitably be used throughout the FOX NASCAR season. This year Skip’s room consisted of a simple truss design with five spark machines hanging from it. Drivers would stand a few feet in front of the structure and when action was called sparks would fall behind them. The room was shot in slow motion causing the sparks to drop like snowflakes. Very cool stuff. 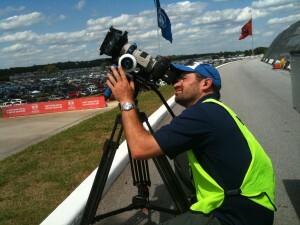 2010 saw Atlanta Director of Photography, Tom Wells, return this season for a handful of races for FOX. At the hanger shoot Tom DP’d the Punch Cam room. The room was literally a boxing ring. 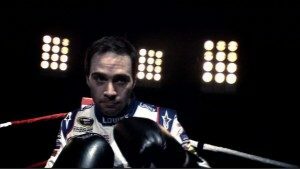 Drivers would throw on a pair of boxing gloves and a robe and take punches a specially designed camera rig. On top of that Tom also ran second camera for Skip, shot some pieces solo, and knocked out some billboards too. Of course, like every year a new apprentice is brought in to the equation to run audio. This year’s apprentice, Roger Woodruff, is actually a big NASCAR fan. This made the season a bit more interesting. Luckily he was able to control himself as he mic’ed up drivers like Jimmie Johnson and Kevin Harvick. Another exciting addition was the use of the Cannon 7D. This HDSLR camera has the ability to shoot in 24p and you can over crank it to 60fps as well. The results, with the right glass, are breath taking slow motion shots with a shallow depth of field. Just think NFL films without the hassle of actually shooting on film. FOX was very excited with the addition and it definitely became the hit of the season. With Skip using the 7D in Victory Lane, that opened the door for Roger to get some valuable hands on experience with the Varicam. By the end of the FOX season Skip’s apprentice was not only shooting “crazy cam” in Victory Lane but during the race as well. For Roger it was a dream come true to be shooting NASCAR’s race winners. Quicker than you could say “Pit Stop,” FOX passed the torch to TNT. TNT’s season is quite shorter than FOX’s but just as action packed. The biggest highlight of the TNT season has to be Tom Wells stepping in for Skip on a few of the races. Tom fit right in and got to work. TNT hardly noticed that Skip wasn’t there. Sorry Skip! Both Skip and Tom shot episodes of the Ponytail Express with Kyle Petty. These comical episodes saw Kyle Petty do everything from explore our nation’s capitol to skydiving in Florida. Aside from the Ponytail Express there were also interviews and garage b-roll to be shot. It’s still hard to believe that the NASCAR season is over for Skip and GTT. This season moved very quickly. Fortunately the 2011 season is only six months away.